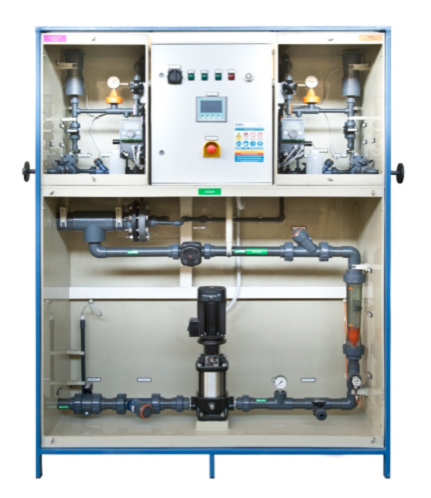 Where there are some space constraints for the installation, the Compact Systems are the best solution to provide a cost effective Chlorine dioxide treatment. The Compact system provides the powerful ISIA chlorine dioxide technology in a very small package. The whole system is enclosed in a steel frame with the maximum size of 2500x700x2000(h) mm. After the positioning, the System has only to be connected to the dilution water source, to the injection point, to the two reagent sources, to the 230Vac power supply and it is ready to run. The System handling can be performed by means of a forklift only. The System can be tailor made as per customer needs: on board or in-basin reaction chamber, titanium pump for pressurized injection point, a distribution panel for multiple injections. The System has the possibility to have a serial link in order to be interfaced to the major part of the PLC or DCS. In this way it is possible to be monitored directly from the existing control room.